Need more information about booking Home 227872 ? From 1 May to 31 October 2015 get 30% off a stay of 5 or 6 nights; or 35% off for 7 nights or more. Located in an exclusive gated community near Bangtao Beach means you can relax in comfort and safety whilst enjoying the exotic charms of Thailand's most coveted island. This stylish and contemporary 3 bedroom villa is the ideal place for a family or small group to enjoy a relaxing holiday in a luxurious private tropical paradise. The villa's private swimming pool is steps away from the open style living room. A roof top sala with a barbeque area allows for relaxed outdoor dining and entertaining, while unique water features add to the refreshing environment. The villa is optioned with state of the art technology including indoor/outdoor music system, touch pad mood lighting control and Wi/Fi which means you are connected anywhere and everywhere. The upstairs master bedroom contains a king size bed and has a private ensuite that features a hand made Terrazzo bath. The master opens to the spacious rooftop sala. Situated on the west coast of Phuket in the southern part of Thailand this villa is less than a kilometre to the white sands and gentle lapping waters of Bangtao Beach. 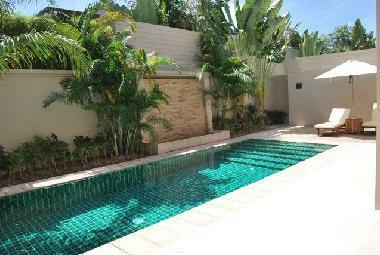 The villa is 20 minutes from the airport and an easy drive to all of the facilities that Phuket has to offer. A car is handy but not essential and motor bikes are a novel way to get around Phuket; if you want something a little more adventurous! Just a gentle 10 minute walk is the wonderful Bang Tao Beach, probably Phuket's best beach. With the crystal clear water of the Andaman Sea and 7 kilometres of white sand, this is truly paradise. You can just lay back and relax under the shade of a palm tree or take a gentle stroll along the beach. There are many local and western restaurants in the area all within a few minutes of the villa. Bang Tao beach has many local and international restaurants and bars at the water's edge, or you can walk along the beach to the exclusive Laguna Resort hotels for something more formal. Within a short distance of the villa you can find everything you may need whilst enjoying your holiday in the nearby Bangtao and Cherngtalay villages: there are 3 supermarkets nearby, a bakery, wine store, delicatessen and every day a local market for fruit, vegetables and cooked food, and a host of small local shops and some wonderful artefacts stores and art galleries. For the golfer, there are seven courses on Phuket and also a nearby driving range. At nearby Surin beach there are plenty of opportunities for para-sailing or jet skiing and a myriad of places to eat and drink. For those who like to shop and barter or enjoy a busy nightlife, then Patong is only 20 minutes away. Phuket features many local markets and has world class shopping centres.